Composition shingles roofing will be found on a roof with a pitch of 2/12 and above. 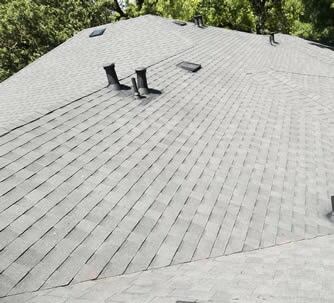 This type of roofing comes in many brands, colors, and patterns. There is your basic three tab shingle, the middle grade dimensional roofing shingles, and then you have your high grade Lifetime Designer roofing shingles. This photo shows a GAF Roofing brand color Slate 40 year roof. Although there are many brands available, the two brands we use the most are GAF Roofing and Certainteed Roofing. We have found these roofing shingles to be reliable and the companies stand behind their lifetime warranties. Most other manufacturers offer only a limited lifetime warranty on composition roofing shingles. For information on how composition roofing shingles can be used for your roofing, call us today at (707) 584-5900!